Context of comment:Was speaking with another mviews member and we seemed to be saying that it might be useful to support existing MountainViews material with some other less technical, lower level info: the kind of stuff you might want to know if you were visiting a hill for the first time or in fact just starting into the sport. Something in the vocabulary of the non-technical visitor. Wonder what the site thinks. The following, just a kind of example. 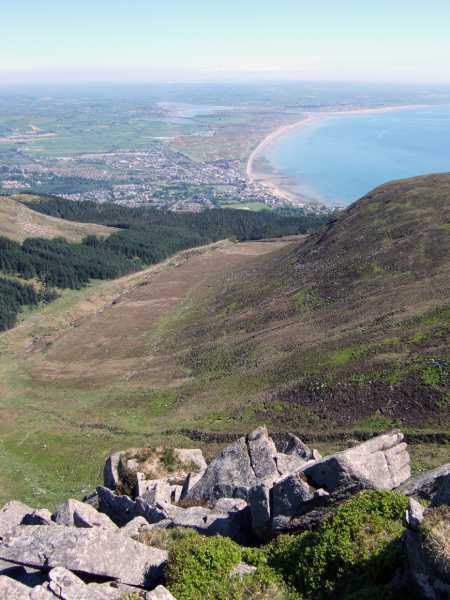 ..... Slieve Donard is the highest hill in Northern Ireland and one of the group of Mourne Mountains in Co Down and rises from behind the town of Newcastle. It is an hour and a half from Dublin, via Newry and Hilltown - or the longer coast road via Newry and Kilkeel. Best, most secure and easiest place to park is Donard car park in Newcastle. This is on the Kilkeel end of the town and gives you direct access on to the main trail up to Slieve Donard. Called the Glen River Track. The car park can get very busy so parking before 10am at weekends is a good idea. The Car Park has public Toilets. There are shops close by for provisions. Most times of the year Slieve Donard is well walked so you will always have company. The track is steep in sections but easily managed by most reasonably fit walkers. A regular walker will get to the summit and back comfortably in around 3 and a half hours. Convenient accommodation in the area includes Slieve Donard Hotel, Coolgreeney B&B, Little Haven B&B, Youth Hostel. There are some good restaurants in the town and nearby - and for convenience, a good atmosphere and good value I would recommend Hugh McCanns which backs on to Donard Car Park and is part of O'Hare's Pub. O'Hare's pub generally has entertainment and is a convivial spot. Newcastle is a busy tourist and shopping town and you will find things much cheaper than in the South.